Nick Lemieux is getting rid of a lot of perfectly good rope. It’s not new, but much of it he has been using for a few years and would use for a few years more, if not for a new federal law that restricts what kind of rope lobstermen can use as ground lines for their traps. Lemieux has been working for the past several weeks in the garage of his Cutler home switching out the old rope, which floats toward the surface to keep it from getting tangled on the jagged ocean bottom, and getting the new rope ready. Starting April 5, lobstermen must start using the new rope, which sinks to the ocean bot-tom, as a way to help keep whales from getting tangled in their gear. 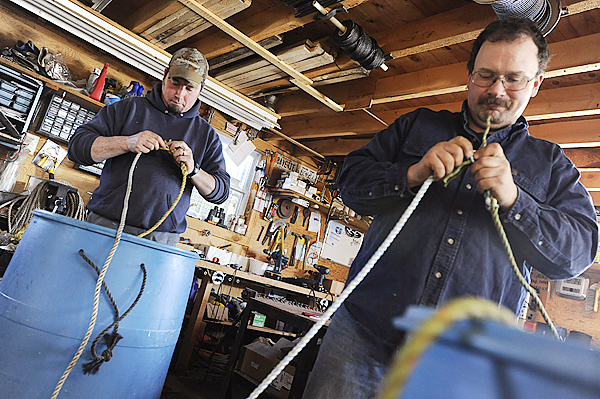 Lemieux, vice president of Downeast Lobstermen’s Association, recently piled the old “float” rope high on a pallet in his garage and secured it with plastic wrap to keep it from spilling onto the concrete floor. He said he’ll probably end up with eight pallets’ worth of the old float rope that he’ll have no use for. It’s not just the disposal of the old rope that has Lemieux and thousands of other lobstermen concerned. The profitability of Maine’s iconic lobster industry, which earned more than $280 million in 2007, was hit hard last year. The cost of fuel and bait soared while the economy tanked and the price lobstermen got for their catch went into a dive, sinking from an average of nearly $4.50 a pound the previous year to close to $2 last fall. Do you think the new sinkable rope rule will hurt the lobster industry? Because sink rope is more expensive than float rope, and because it is more prone to snagging on the rocky ocean floor, lobstermen fear it is going to take an even sharper bite from their bottom line. The result, many lobstermen have said, could be that some of them go out of business — a significant sacrifice to make for a sea mammal that many lobstermen say they have never seen near their traps. According to conservationists, the outlook for endangered whales, especially right whales, is even worse. 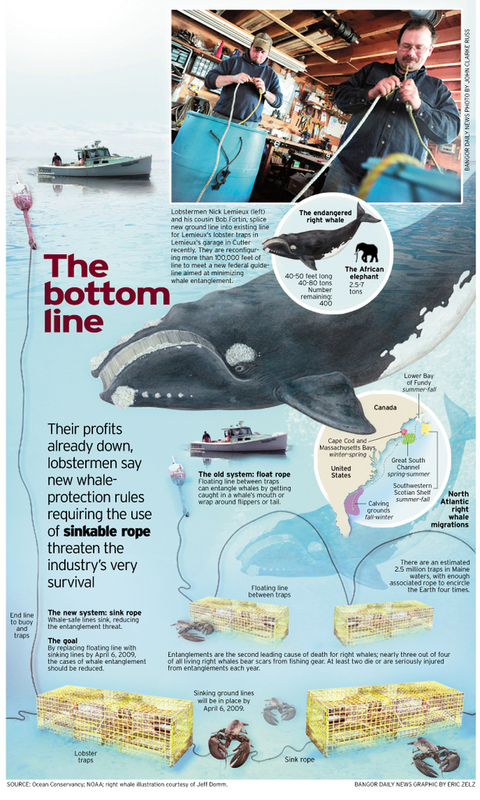 In recent years they have pressured the federal government to act on float rope, which arcs up toward the water’s surface between the traps that lobstermen set in a line on the ocean bottom. These arcs act like snares when whales dive underwater, conservationists say, and are a likely cause of entanglement scars that are visible on more than half of the remaining 400 or so right whales in the North Atlantic. More than 250 whale entanglements were reported along the East Coast between 1997 and 2005, according to federal officials, and more than one-third of those involved lobster gear. Entanglements kill or seriously injure about two right whales each year, whale advocates say. With such low population numbers, even one en-tanglement poses too great a threat to the survival of the species. To compel the federal government to take action, Ocean Conservancy and the Humane Society of the United States filed suit in 2007 against the National Oceanic and Atmospheric Administration, claiming the agency was not living up to the requirements of federal environmental laws. The agency needed to enact new rules to better protect endangered whales from harm, the groups said. George Lapointe, commissioner of Maine’s Department of Marine Resources, said his department argued that there needed to be more documentation about the overlap between whales and lobster gear before federal regulators enacted the new rules. Nonetheless, NOAA decided to impose the new rope restrictions. But there are some exceptions. Traps set in near-shore waters, defined by an exemption line that runs roughly three miles offshore from most of Maine’s coast, do not have to have sinking ground lines. End lines, which connect traps to a buoy floating on the surface, also are exempt. Because of these exemptions, the new law is not as good as it could be, according to Vicki Cornish, Ocean Conservancy’s vice president for marine wildlife conservation. Contrary to what many fishermen claim, she said, entangled whales have been spotted in areas inside the exemption line. Despite these exemptions, many lobstermen are concerned the new rule could spell the end of their livelihood. The upfront cost for each lobsterman for putting sinking ground lines on all their traps, which are limited to 800 per person, has been projected at $5,000 to $15,000. Lobstermen say sinking rope wears out faster because it chafes back and forth on the ocean bottom, and so will have to be replaced more frequently. When it wears out to the point that it breaks, they may end up losing traps and perhaps entire multitrap trawls on the bottom. Not only will this be expensive, but it also will litter the ocean bottom with lost gear that could end up affecting other species, fishermen have said. The Cutler lobsterman said it will cost him $10,000 just to buy sink rope for all 800 of his traps. If he goes to haul his gear and both end lines of a trawl break off, he will have to try to drag his traps up by fishing for the ground line with a spiked piece of iron. Traps cost about $70 to $80 each, he said, and one trawl’s worth of equipment could cost $1,000. The new rope also could pose an increased safety hazard, according to Lemieux. Ropes can injure fishermen if they snap when under strain, he said, and even when sink rope is not worn it can behave differently from float rope when being handled. If a lobsterman lays off his sternman in an effort to save money, a ground line that snaps when traps are hauled on board or a loop that catches a lobsterman’s foot could prove to be especially dangerous without that help aboard the boat, he said. Lemieux said he believes lobstermen are having to shoulder too much of the responsibility of trying to restore whale populations to a healthy level. Lobstering is not only a livelihood for many people, he said, it’s the only option many people have in rural Maine. Laura Ludwig, coordinator of a voucher exchange program run by the Gulf of Maine Lobster Foundation, said the foundation has been giving lobstermen vouchers of $1.40 each for every pound of float rope they have turned in at exchanges held along the coast. The vouchers can be used as cash when the fishermen buy sink rope, which sells for more than $2 a pound. So far, the foundation has handed out more than $1.3 million worth of vouchers in exchange for nearly 1 million pounds of float rope, Ludwig said recently, but it is running out of money, much of which has been provided by the federal government. The foundation has a waiting list of 363 lobstermen who cannot get vouchers unless the foundation gets more funding, she said. She estimated that Maine’s lobster industry is still using 5 million pounds of float rope that will become obsolete next month. Ryan Post, a Metinic Island lobsterman, recently said he sets his traps around the island in water that is about 50 feet deep with jagged bottom. No whale, he said, is going to swim through that kind of environment, but because Metinic is outside the exemption line, he is expected to use sinking ground line on all of his multitrap trawls. Post said he has tried one brand of sinking ground line but it did not work effectively where he sets his traps. Even if it did work, he said, he did not make enough money last year to be able to afford the more expensive type of rope. So to get around the new federal law, he said, he plans not to have any ground lines at all. He fishes a full allotment of 800 traps, and plans to set each trap with its own individual buoy. “I’m going to fish all singles,” Post said. When told of Post’s comment, Ocean Conservancy officials seemed exasperated. Cornish expressed disbelief that state officials would allow lobstermen to avoid the new ground-line restriction by increasing the amount of end lines in the water. “It really comes down to the state of Maine to address this issue,” she said. End lines, according to Cornish, are next on the list of potential whale hazards that will be addressed by fisheries regulators. Studies have shown that fishermen can catch the same amount of lobster by fishing fewer traps, she said, which not only would reduce the number of end lines in the water but also would help lobstermen reduce expenses. Ocean Conservancy wants fewer traps and fewer end lines in the water, not more, she said. Terry Stockwell, DMR’s director of external affairs, said the state intends to address the risk of end lines. Last year, state officials tried to get support for reducing end lines in the so-called “sliver waters” that lie between the exemption line and federal waters. In those areas, he said, the state would have banned the use of single traps but would have allowed fishermen to continue using float rope. The proposal was taken to a multiagency task force that has been studying the issue, but was rejected. “The environmental community did not support it,” Stockwell said. As for reducing the number of traps in the water, Stockwell said DMR is opposed to doing this as a means to address the whale issue. Stockwell said there needs to be more research on the degree and type of contact between whales and lobster gear. The department is trying to develop more comprehensive data about the position of fishing gear and the frequency of whales in the Gulf of Maine so it can find out how lobstermen and whales can safely coexist, he said. “Our whole program has been the equal protection of whales and fishermen,” Stockwell said. 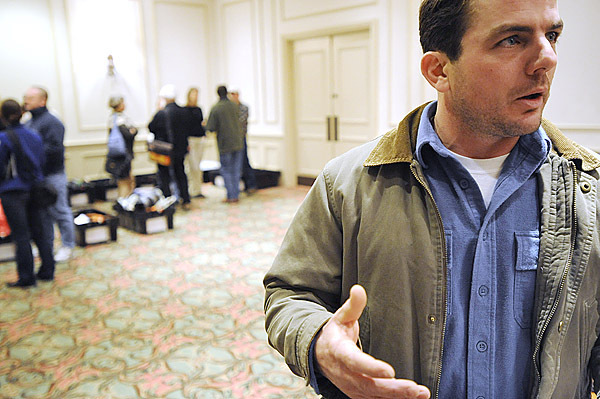 Cousens, the MLA president, said more and more of what he and other lobstermen can do likely will be determined by federal environmental laws. The new rope regulation, he said, is a good example. Cousens, who fishes out of South Thomaston, also is getting ready for the coming fishing season by putting sink rope on all of his traps. But he said that doesn’t mean he is optimistic about how well he, or Maine’s 6,000 other licensed commercial lobster fishermen, will do this year.